Apple upgraded the new MacBook's 13.3-inch screen to use LED backlighting, which provides better overall brightness for the same 1280x800 resolution. The new panel also delivers significantly better color and viewing angle performance as the previous MacBook, but it still isn't as vivid and wide-angle viewable as the MacBook Pro screens. It has the same rated contrast ratio as the similarly-sized MacBook Pro. The most significant difference between the two models is that Apple advertises a 60 percent greater color gamut for the Pro version. 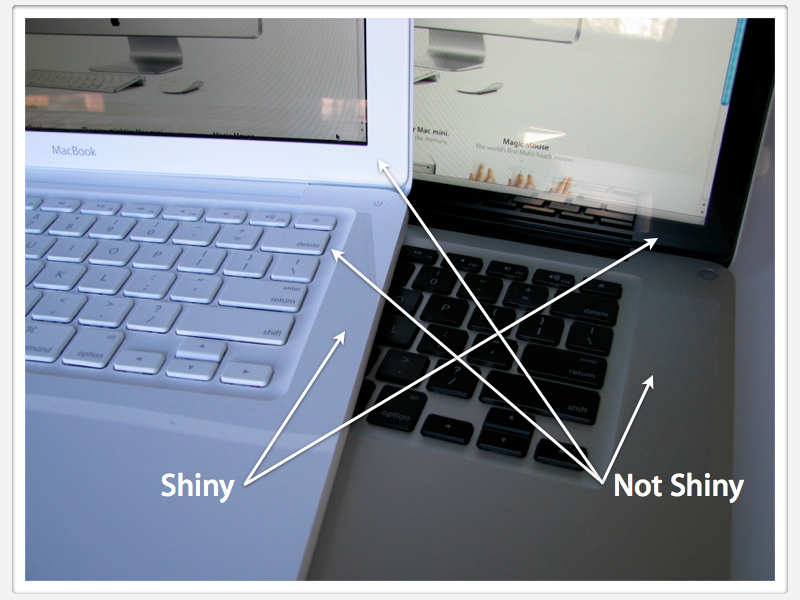 The MacBook's flat white margin around the screen is one of its two surfaces mercifully missing a high-gloss sheen (the other being the indented area behind the keyboard). The aluminum MacBook Pro sports a black display margin covered in glass, which tends to make the screen's colors snap vividly (in contrast to the shiny black), but also creates a distracting ring of reflective mirror around the screen. This makes it hard to avoid background glare, not just on the glossy screen itself but from the entire lid's surface. Apple decided to tone this down (and actually reverse things) on the MacBook, so while the palm rest and top cover are now clear coat shiny, the parts that you focus on while actually using it are a flat matte white. This results in what seems to be less contrast for the display, but the screen actually seems to perform just as well, it just has a flat white frame rather than a shiny black one. The display itself is still as glossy as the other MacBook models, and there's no option for a plain matte screen finish on this model. Apple says that users overwhelmingly prefer the glossy option (it knows because it previously offered both versions). Glossy not only looks more pleasing but is actually more color accurate than a flat matte screen, which diffuses light, providing a softer image. Those pluses tend to overshadow the annoyance of reflective glare, but do nothing to assuage users who are not a fan of glossy screens. Unlike the aluminum models, the MacBook's screen and its frame are not one smooth surface behind a panel of glass; the screen is inset slightly, so you can't wipe the screen off from edge to edge. The edge does have a slight bevel to it however, which helps prevent it from collecting a line of dust that's hard to clean away. Above the screen is a more subtle, round iSight camera with a recording indicator lamp. There's a mic integrated into the body of the notebook, but if you're recording videos or videoconferencing with iChat, you might want to use the integrated mic on iPhone-style headphones. The new MacBook retains the same indented keyboard that debuted in 2006, but now sports a larger glass multitouch trackpad. The white keyboard, its white margin, the white trackpad, and white cover makes the new model perfectly camouflaged against a a snow storm, and differentiates it from the silver and black finish of the MacBook Pro line. The new keyboard feels the same as the previous model. The white keys with light grey labels are a bit subtle, but do not seem difficult to read. There is no backlit keyboard option on the white MacBook, so if you want to type in the dark you'll have to rely on illumination from the screen. Like the previous MacBooks, it sports the same updated F Key shortcuts, including volume and audio playback buttons, Exposé and Dashboard buttons, and screen illumination controls. The MacBook's new large multitouch trackpad replaces the previous version with a separate physical button below the trackpad; the entire surface of the trackpad functions as a button. More accurately, the bottom 80 percent of the trackpad surface acts as a clickable button while the top edge is fixed. This is the same trackpad that appeared on the MacBook Pro line last year; our MacBook Pro review described its pros and cons. On page 3 of 3: Expansion ports; Performance overview: CPU and RAM; The New MacBook in Review; Rating 4 out of 5; and Where to Buy.